Striking and beautiful, this yellow gold bezel set Heart shape diamond necklace commemorates the essence of love and lets her know that she is the only one. 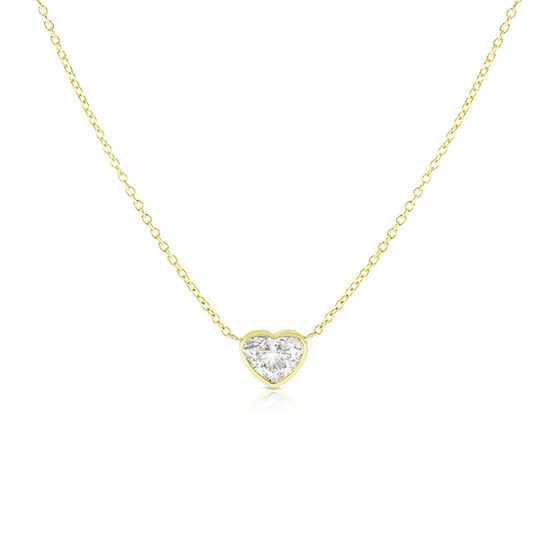 Shown here with a 0.82 carat F color SI1 clarity Heart shape diamond, bezel set, on a 14k yellow gold cable chain. Available in additional sizes for custom orders. This necklace makes the perfect birthday present, anniversary gift or push present especially for April babies, as diamond is the April birthstone. This single diamond necklace can be worn by itself or it can be layered with other fashionable necklaces. Ships In: Please allow 2-4 weeks to ship.